When we visited NYC a couple years ago, we were able to check out Brooklyn Boulders. We had so much fun there that we ended up staying for 6 hours when normally we’d be at the gym 3 max. When we decided to move to New York, our top priority for apartment hunting was based on how easy it was to get to the gym. Now, it’s easily our second home. It’s hard to believe that it’s been 3 years since we first started climbing in San Diego. It feels like just yesterday. Since we move to a new city every year and also travel quite a bit, we’ve been able to visit a lot of climbing gyms and meet many different climbers. This week, we decided to put together some hacks, tips, and tricks that we learned from others over the years plus some more insightful tips we recently learned from Garrett, the head setter at Brooklyn Boulders. Hopefully, these will help you get better faster on your climbing journey. Depending on the person (and shoe), climbing shoes can have a STRONG odor caused by moisture. Mine are pretty nasty since I’m constantly scared and constantly sweating. 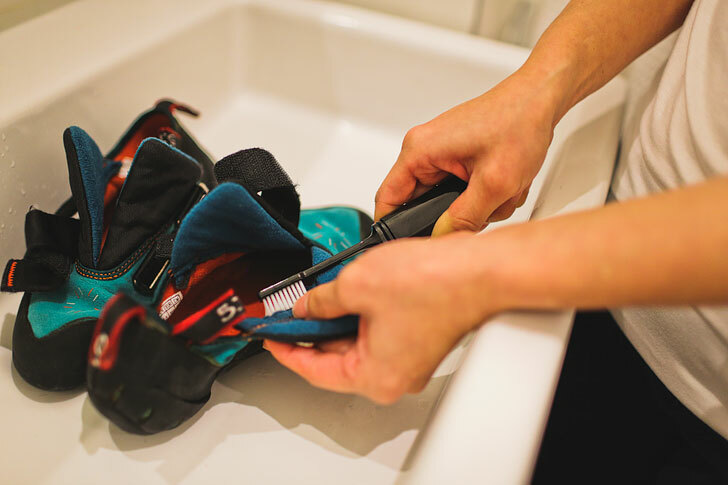 The best way to combat funky shoes is to make sure you take them off in between climbs and dry them as soon as possible after your climbing session. Some people use a hair dryer to dry out any moisture, then add cedar chips, baking soda, baby powder, or gold bond into the shoes. Anyone else has these shoes? When they get unbearable, I take some laundry detergent and scrub them down with a toothbrush.